Making your own fenugreek sprouts is easy and a tasty addition to any salad! Fenugreek seeds are used as a spice but are actually legumes that can be sprouted like other legumes. 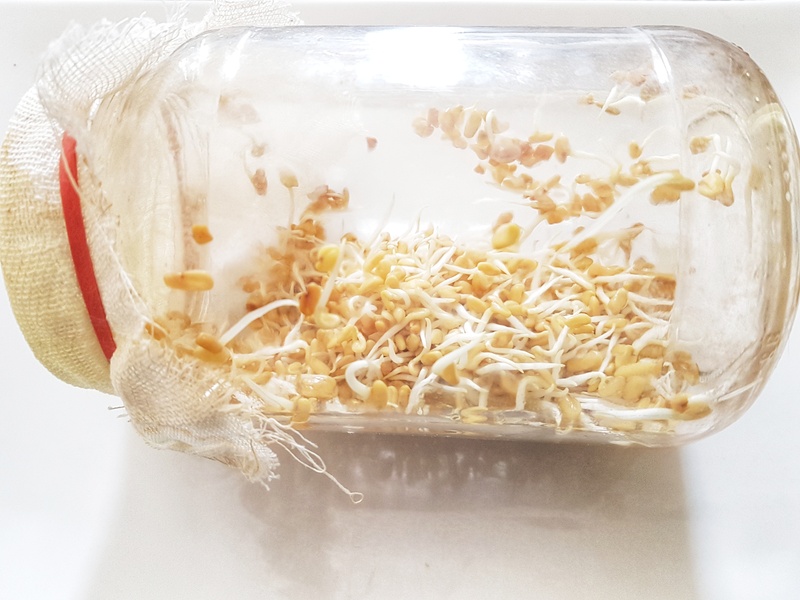 Sprouting increases the nutrient content as well as digestibility of the legume. You can use these sprouts raw in salads. You can add up to one cup at a time, depending on your taste. For safety reasons, ensure that you store the sprouts in a safe container in the fridge for a few days. -Fibre – 100g of seeds provides 25g fibre. In fact, fenugreek is used as a food stabilizer and emulsifying agent due to its fibre, protein, and gum content. Seeds contain insoluble and soluble fibre and the gum portion contains galactose and mannose which are associated with its blood sugar lowering effect. But keep in mind that sprouting the seeds will alter or increase the content of many of these nutrients. –Pungent and bitter. Warming. Balances kapha and vata doshas. Choose a good sized mason jar with a wide lid. Remove the lid, and place a mesh or cheesecloth or muslin cloth over the mouth of the lid, secure tightly with an elastic band. Place the seeds in the jar, fill with water, secure the mesh on top and leave for 12 hours (or overnight). Twice a day (once in the morning, once before bed) rinse the jar under water, through the cloth. Place back on the plate. After 2 days, sprouts will show. However, leave the sprouts to grow longer, for up to a week. At the end, remove the sprouts and store in a container in the fridge.